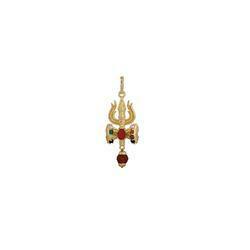 Leading Manufacturer of 5 faced rudraksha and genuine semi precious navratna gemstone pendant, navratan divine pendant, navratan om locket with rudraksha mala 5mm 55 beads, designer party wear synthetic brass navratan pendant, designer party wear synthetic navratan gold plated pendant and shiv shakti kavach 5 mukhi rudraksha pendant from Jaipur. The ‘Designer Party Wear Synthetic Brass Navratan’ is an amalgam of the nine most precious gemstones, renowned for their powers of spiritual healing. 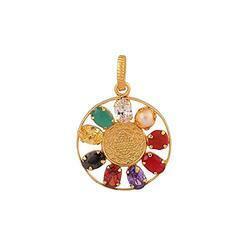 The mystical tradition of wearing the nine gems, linked to the nine planets is said to bring about great positive changes in all aspects of life. Although the origins of Navratnam cannot be traced back in written history, many cultures accept the sacred practice and even the modern believers of scientific gemstone therapy have taken note of it with approval. 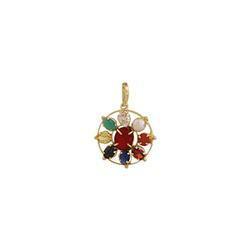 Pendant is round shaped with all Nine gems stones. 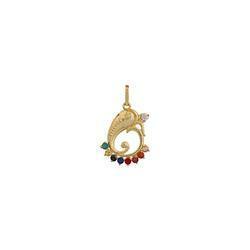 This Piece of jewellery comes with Parure assurance of Quality and Durability. Each Crystal is 100% hand set by skilled craftsmen. 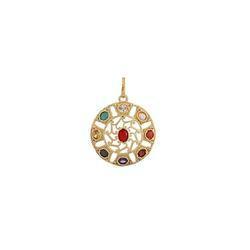 Designer Party Wear Synthetic Navratan Or Navgrah Rhodium Gold Plated has navratnas which is very connected to the pendant. 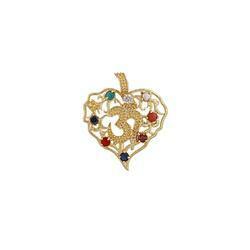 The nine gems are ruby, pearl, diamond, emerald, blue Sapphire, yellow Sapphire. Inside this in a circle, a big gemstone in carved. 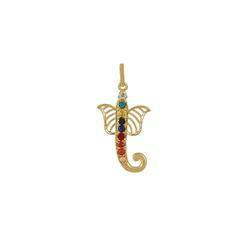 Pendant is made of brass and has gold polished on it. 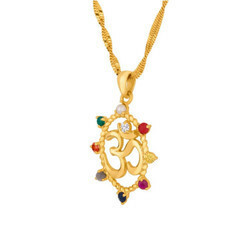 This pendant has the sides which is believed to be the strongest shape in the world and the stones which are engraved in it increases its beauty.